Lock in a great price for Woodbury Tented Camp – Amakhala Game Reserve - rated 9.1 by recent guests. Everything about Woodbury tented was incredible. The are also all fantastic! Location stunning. Animals magical. Food excellent. Staff couldn't do enough for us. Knowledgeable guides. Peaceful setting. Unbelievable landscapes. The homemade bread was delicious! Being under canvas added to our experience. The enthusiasm of our ranger, Brad. Excelent place with lovely people! We got to see the big 5! Our guide, Hanco, taught us all about the reserve. The tent is very clean and has a lot of luxury details. Food is great too! Extremely comfortable accommodation. Excellent food. Thoroughly enjoyable game drives with knowledgeable guide. Perfect stay! Wonderful from start to finish. Warm, approachable staff, amazing game drives, magical sundowners, warm fires, hearty food, flapjacks on tap, sweets on our pillows, electric blankets at night... couldn’t rate it more highly! The whole experience was superb. The staff all went the extra mile to ensure the best outcomes for our trip. The weather was against us for 50% of the time but the Woodbury Team were well prepared and we still saw lots of the wildlife. Amakhala itself is a great game reserve with a beautiful landscape and many animals to see (including Big 5). All Lodges follow the same rules which is good for the wildlife. Woodbury Tented was the first game reserve experience for us and absolutely great. The lodge is not luxurious but cozy, comfortable and certainly more than adequate. We liked the tents and they are also really comfortable. Our guide (Leni) was super funny and knowledgeable. The rest of the staff was also great. They even help me to make a perfect wedding proposal to my girlfriend there (thanks again for that). Would definitely recommend it. One of our bestsellers in Amakhala Game Reserve! Located in the heart of the Amakhala Game Reserve, Woodbury Tented Camp offers an authentic outdoor experience in safari tents. 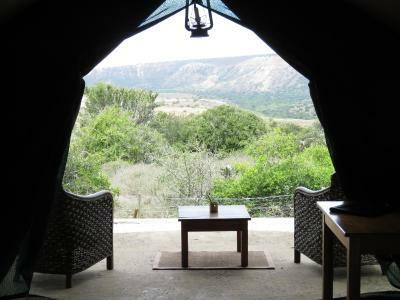 The camp overlooks the ancient floodplain of the Bushmans River. 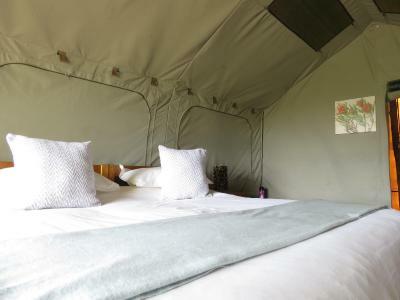 The en suite canvas tents have a patio and offer views of the valley. Each has a built-in shower, hot running water and electricity. All meals and drinks are included in the rates at Woodbury. Guests can relax in the thatched entertainment area, which is located in the centre of the camp or sit by the camp fire. Activities at Woodbury Tented Camp include game and bird viewing in the Amakhala Game Reserve. 2 game drives per night are also included within the rates. Grahamstown is 28 miles away from the camp and Port Elizabeth Airport is 49.7 miles away. 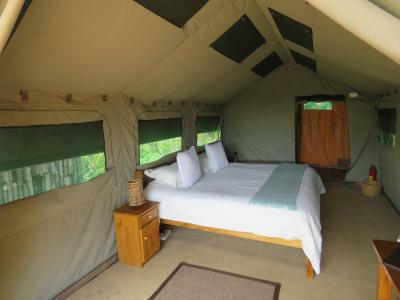 Woodbury Tented Camp – Amakhala Game Reserve has been welcoming Booking.com guests since 27 Sept 2013. When would you like to stay at Woodbury Tented Camp – Amakhala Game Reserve? 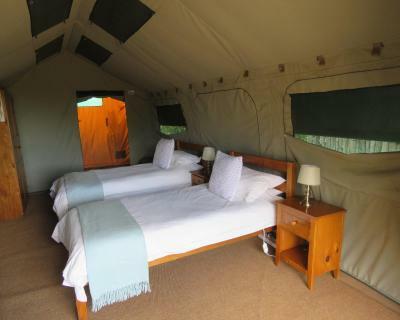 These spacious canvas tents are en suite with a built-in shower, hot running water and electricity. Each tents also has a private patio. The family tents are on raised platform with private decks, set amongst the trees providing privacy. 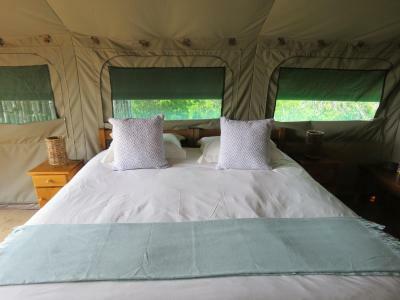 The main canvas safari tent has an en-suite basin, shower and a separate private toilet. The beds are fitted with electric blankets. The children's tent is adjoining on the private wooden decking. Each safari tent has 24 hour electricity and running hot water. A tea and coffee station is also available in the main tent. House rules Woodbury Tented Camp – Amakhala Game Reserve takes special requests - add in the next step! Children 6 and older are allowed at luxury tent. Woodbury Tented Camp – Amakhala Game Reserve accepts these cards and reserves the right to temporarily hold an amount prior to arrival. The rate includes all meals and drinks and 2 game drives per night stay. Please note that children under the age of 6 cannot be accommodated at Woodbury Tented Camp. The price is crazy for the quality of the tent, the safari and the food. No shade in the pool area. It was newly opened so no doubt they will eventually get around to putting shaded area there. Words cannot express how wonderful it was. The tents were great the surrounding were fabulous. A wonderful view of the game reserve from balcony. Food excellent. Staff friendly. Safari fantastic. Wish we had a third night there. The weather! It was unseasonably cold and wet for a day and a half and then transformed to be very warm and dry so be prepared for all the elements. Maybe more vegetarian food choices would be great but it was alright. A Fantastic safari experience in a beautiful setting. We saw lots of animals and really enjoyed our stay. The staff were lovely too. The pool was tiny and the water murky, but they are building on a new and bigger pool. Also, we heard the noise from the main road in our tent, which was the one element disturbing the authenticity of the camp at night. Arriving at Woodbury was already a taste of what was to come - we were greeted by giraffes! The welcome by staff was really nice and we loved the setting of the tented camp in the enclosed nature area, safe from the animals around it. We had a family tent, which meant two tents with shared facilities and really liked the feeling of being so close to nature, hearing the lion roar at night. We also really liked all the meals, from breakfast, lunch and dinner to the game drive snacks brought by the rangers. It was not high cuisine, but really nice homemade food, often with choices that we could make. If anything, there was too much good food, given we were not really moving very much all day. Given the cold weather, Woodbury did everything they could to keep us warm, from open fires burning in the common area, to beds with electric mattrasses in the tents at night. The game drives were outstanding too, with knowledgeable rangers and a fun experience searching for the animals. We stayed four nights and saw almost all (lions, cheeta, elephant...). Would gladly return.